This post is brought to you by Simply Organic Simmer Sauces. 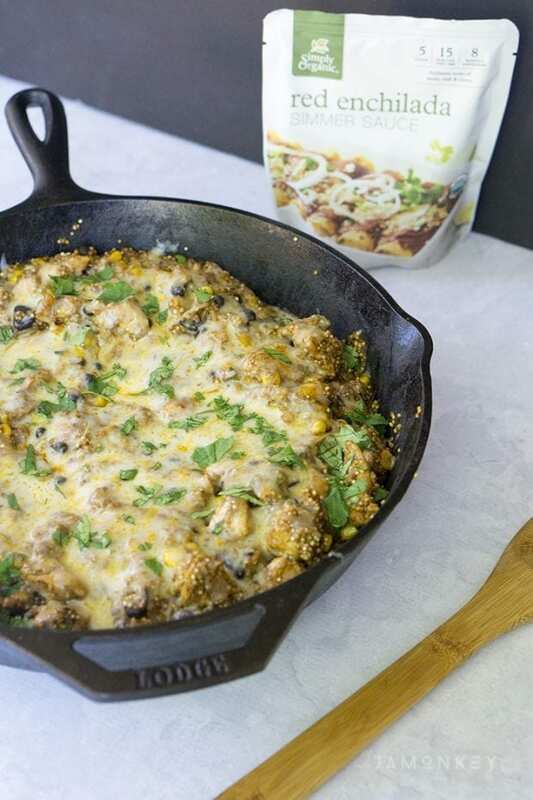 Recipes that require one pot, and can be frozen easily for future meals are my favorite. 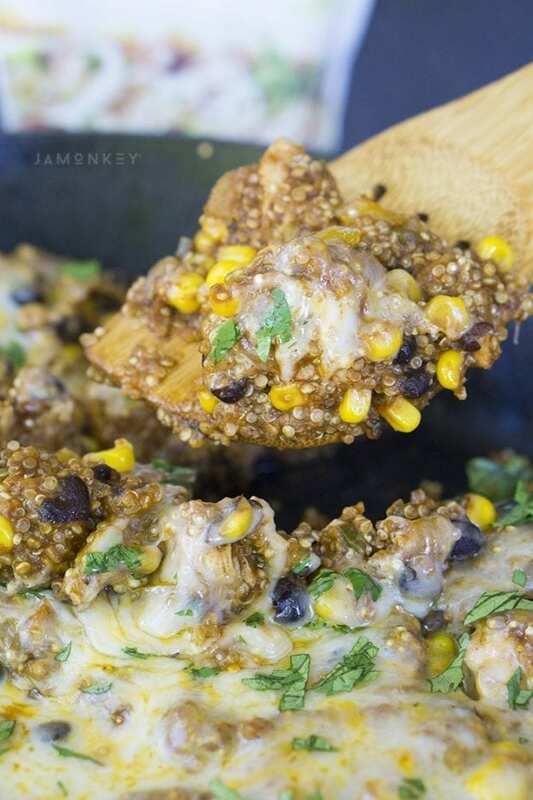 This One Pot Fiesta Chicken Enchilada Quinoa is one of those recipes! One-pot recipes make life easier and the dishes lighter, anyone can get behind that. This recipe can be made and frozen into individual portions if you're looking for something great to eat for lunches. You can also make it vegetarian and add kale and your favorite soybean to pack it with iron and protein. For this recipe, I'm using the Red Encila Simmer Sauce. I'm going to start by cooking my chicken and setting it aside. I set it aside because I don't want to overcook it and I want it to absorb the simmer sauce as much as possible. Saute your onions and peppers together until they are tender. Then add your corn. Push everything over to one side so that you can add the sauce and water to the pan. *TIP* Put your water in the Simmer Sauce pouch to get out as much flavor as possible before pouring it in. 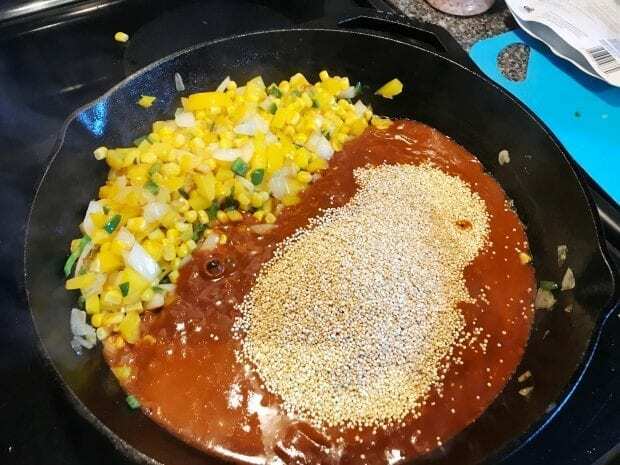 Add your quinoa to the sauce and mix together to make sure all of it is submerged. Bring to a boil and add your chicken and black beans in. Reduce to a simmer. Mix everything together and cover with a lid. This will allow the quinoa to absorb the sauce and the water to make it nice and fluffy. Make sure you stir every 3-5 minutes, so it isn't stuck to the bottom of the pan. Remove from heat and cover with cheese. Replace the lid to melt it. Sprinkle some fresh cilantro on top, serve and enjoy. 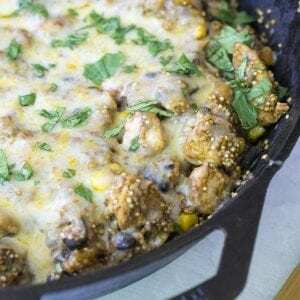 In a large skillet pan, add 1 tbsp of cooking oil on med-high heat. Cook chicken and then set aside. 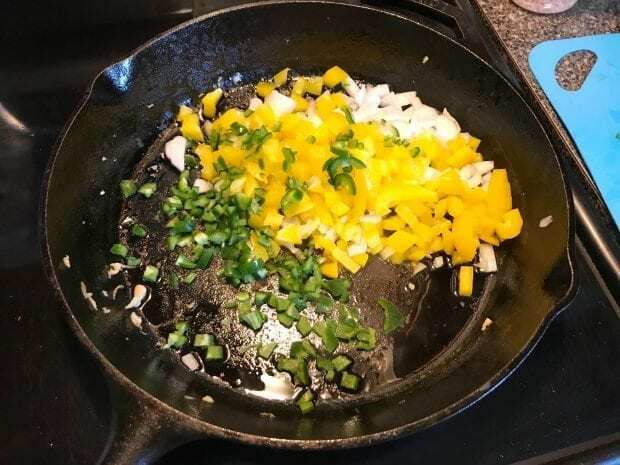 Add 1 tbsp cooking oil and onion, pepper and jalapenos to skillet. Cook until tender. 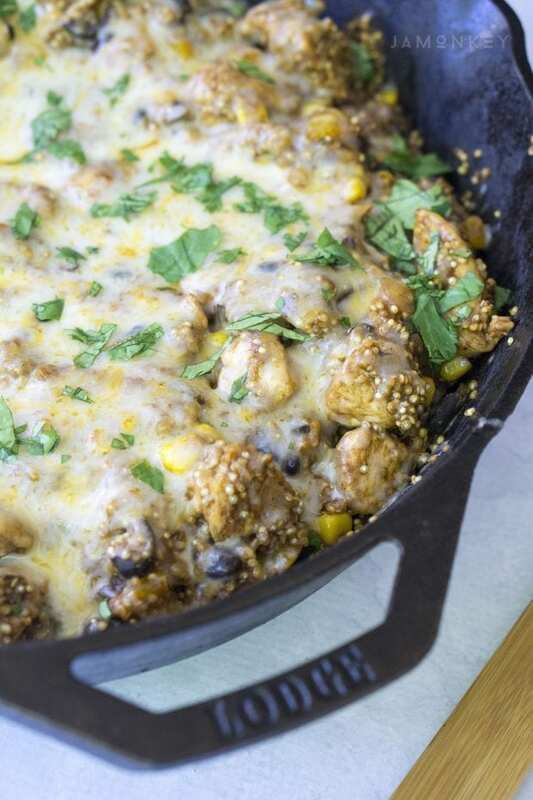 Add corn, black beans, and chicken into the skillet and push all to the side. Add Simply Organic Red Enchilada Simmer Sauce and one cup of water to the open space. 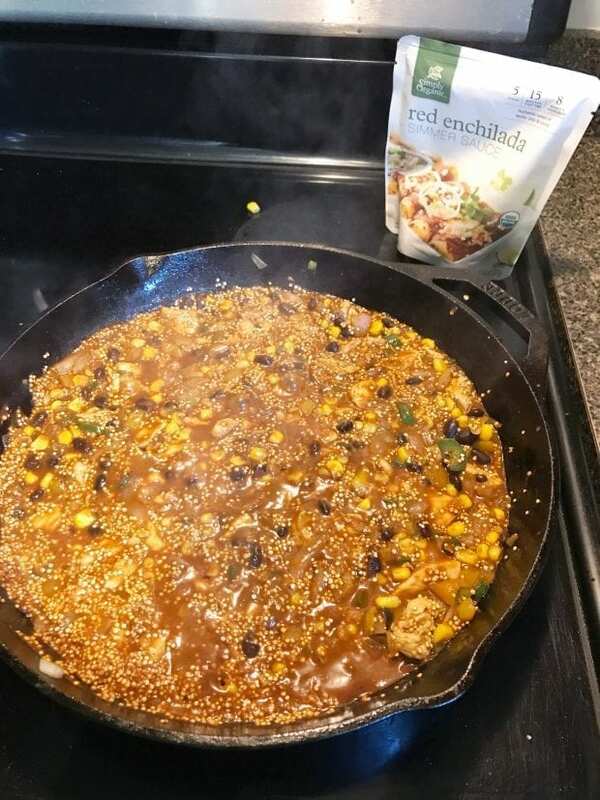 Pour quinoa into sauce mixture and mix so that all the quinoa is submerged into liquid. Bring to boil. Cover and reduce to simmer. Cook for 10-15 minutes. Fluff with fork. Remove from heat. Blend everything in the pot together. 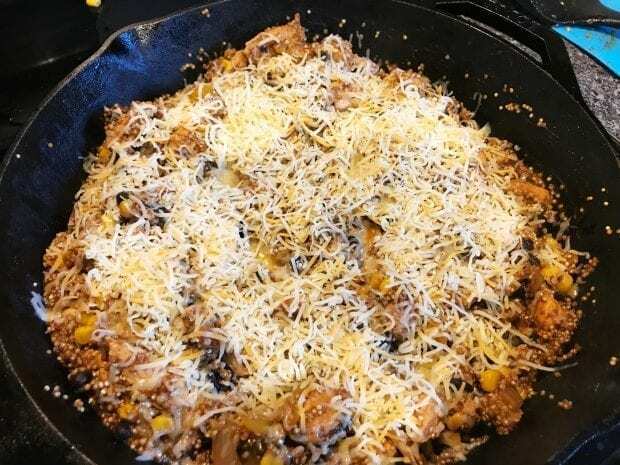 Sprinkle cheese over the top and replace <g class="gr_ gr_82 gr-alert gr_gramm gr_inline_cards gr_run_anim Grammar only-ins replaceWithoutSep" id="82" data-gr-id="82">lid</g> to allow cheese to melt. Thanks for the one pot recipe. Makes cooking so much easier and less messy! 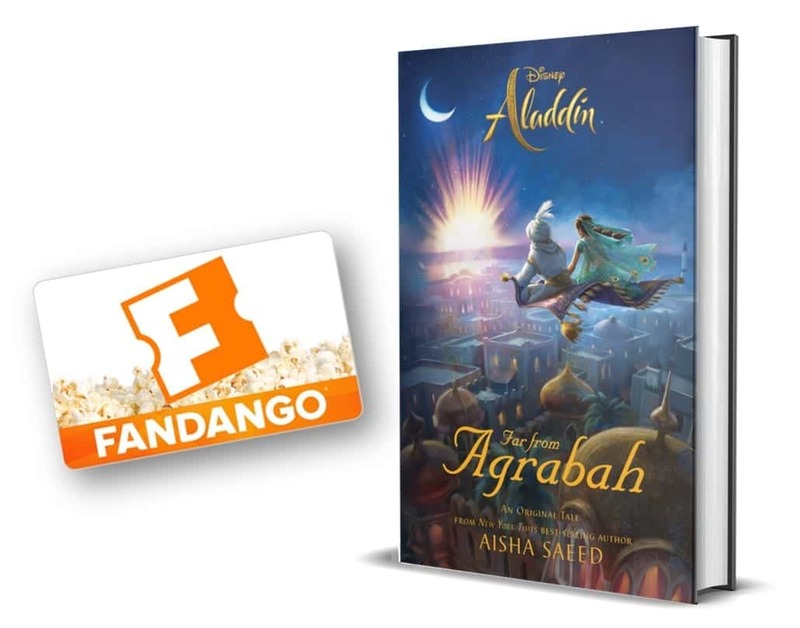 This looks amazing, I can’t wait to give this a try!